Peach Fuzz tells the story of an extremely odd couple: Amanda, an enthusiastic but lonely young girl, and her pet, Peach, a prissy ferret with a royalty complex! Amanda struggles to deal with the challenges of pet care and training, teasing bullies, and even her mother, who threatens to take back the ferret if it doesn't shape up. Meanwhile, Peach, who believes herself to be a Royal Princess of the Ferret Kindgom, must learn to survive in a strange new world. 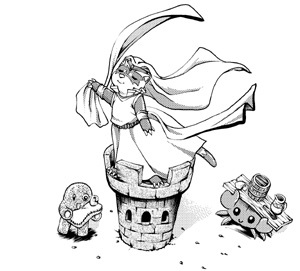 Although Amanda views Peach as a furry friend, Peach sees her as a frightening monster. Together, they must learn to understand each other if they ever want to overcome all the obstacles in their paths. Available in bookstores nationwide. If your local store doesn't have it in stock, let them know you want it by special ordering it! Or, for a copy signed by the authors, order through our website comics shop. Amanda is an enthusiastic but lonely young girl. A trip to the local pet store leads her to discover and fall in love with the most exotic and unique looking pet she's ever seen: a ferret! Unfortunately, she soon discovers that these quirky, tube-shaped creatures are more difficult to manage than one might think! 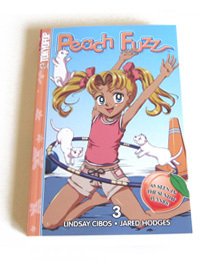 Contains Lindsay's short self-contained story set in the world of Peach Fuzz, which placed as Grand Prize Winner in the Rising Stars of Manga 2 competition. The story chronologically takes place between the first and second volume of Peach Fuzz, and reveals the origin of Mr. Jingles, a small elephant keychain, and depicts the horror of Peach's first bath time experience. It's getting easier to find Peach Fuzz no matter where you live! 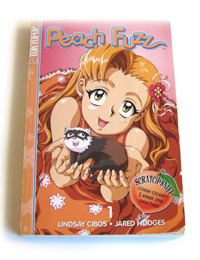 Tokyopop publishes and distributes the original English-language version of Peach Fuzz in the US, Canada, and the UK. Madman Entertainment distributes the English-language version in Australia and New Zealand. 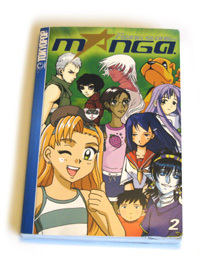 A German-language edition is published by Tokyopop Germany. In Finland, Pauna Media Group publishes a Finnish-language edition of Peach Fuzz. 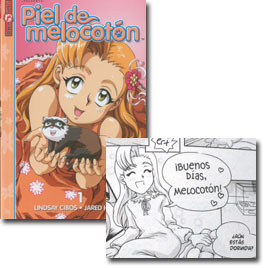 In Spain, the Spanish-language edition of Peach Fuzz is called Piel de Melocotón! The portuguese edition of Peach Fuzz is called A Princesa Pêssego (click here to see a video flip through of the Portuguese edition!). Stay tuned for even more developments! 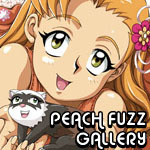 Visit the Peach Fuzz Gallery for Peach Fuzz illustrations, and ferret photos! Danica Davidson of The Graphic Novel Report - "Young readers, old readers, and everyone in-between can take note: Peach Fuzz is a cute and warmhearted series with plenty of laughs." Newtype, January 05 - "The duo proves that they can hang with the best of Japan's Mangaka." All Ages Reads - "Peach Fuzz is very well-written and executed and it’s not just for young girls – I laughed quite a bit." Reading Along - "...a fun comedy series with a lot of heart..."
Peach Fuzz's Newspaper Syndication run! 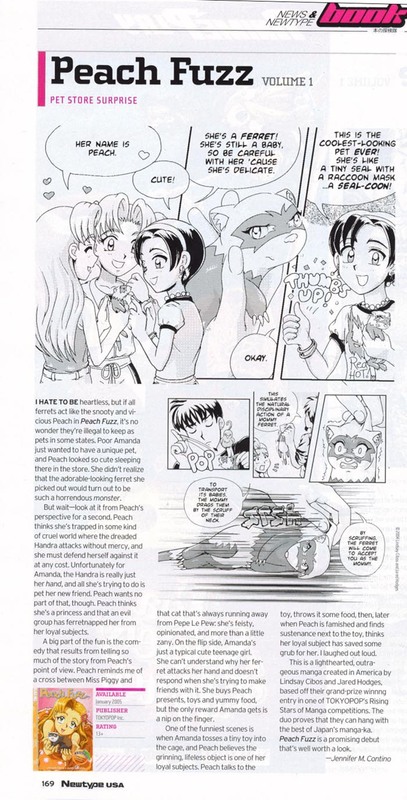 The newspaper version included a journal section that explored Amanda and Peach's feelings as they dealt with their problems. 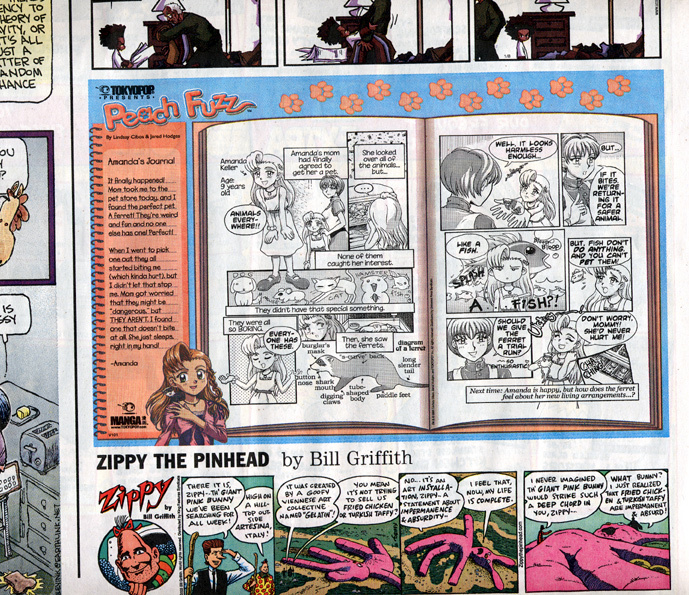 If you missed its original run, or your local newspaper didn't carry it, write them and request that they carry Peach Fuzz in their comics section! Help expand the Peach Fuzz wikipedia article! 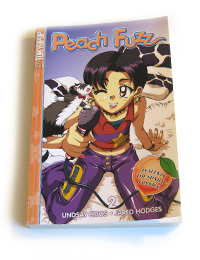 Official Tokyopop Peach Fuzz website with information and samples for all three volumes. Peach Fuzz Vol. 3 Book Signing - Report and Photos! Copyright © 2010 Jared Hodges & Lindsay Cibos. All rights reserved. Distribution or reuse in any form is prohibited without prior arrangement.